Today was my first speaking engagement of 2017. I was super excited about it and loved having the opportunity to share with a group of mothers of preschoolers. As I was waiting to turn into the parking lot I watched wistfully as the mothers crossed the street taking their young children into the school. Some were pushing strollers, some had their sweet ones perched on their hips and many were squeezing tightly on to chubby little hands. Some moms were dressed for the gym and others for work. I’m sure many had their errands planned for their next few hours of precious freedom. As I looked at them I thought back to when I was in their shoes. For me it was usually a mad dash to get my kids to school on time with their nap mats and lunch bags in hand. Often we would remember on the way to school that it was show and tell day and I’d tell them to look around the car for a “treasure” … and more times than not we found one. (McDonald’s Happy Meal Toys for the win … don’t judge). There were always mothers dressed in the cutest and most current outfits with their hair looking salon perfect. I would wonder how they did it. I mean, truth be told, part of the reason my kids were going to school was so I could go home and actually shower in peace. Walking in this morning, nine years since my last preschool drop off, was no different. The first woman I saw had on the most fabulous pink sweater I think I have ever seen. Everything about her seemed perfect … and that same question/feeling swept over me … “Why can’t I be like her?”. What it comes down to really is a comparison game. I was comparing myself to her. And as much as I have read about how much social media sites such as Facebook and Instagram are contributing to the rise of the comparison trap …the game is not new. In fact it’s a “tale as old as time” as Disney would say. Perhaps it started in the Garden of Eden. Eve was told she could enjoy everything in the garden “except” the forbidden fruit. But Eve wanted what she couldn’t have … and when the serpent convinced her that eating it would make her like God, she believed him. In verse five the serpent says … “For God knows when you eat from it your eyes will be opened and you will be like God, knowing good and evil. She wasn’t content in her situation. She wanted something more. She wanted to be the girl who could have ALL the fruit. Later in the New Testament Peter and John were walking along the beach. Peter was talking with Jesus and stopped and pointed to John and said … “Lord, what about him?” (John 21:21) . How often do we feel that exact same way? We want to point to someone else’s situation and say .. “well what about her?”. Why does her life seem so perfect? Why do her kids obey? Why does she get to go on that trip? The list can go on and on. C.S. Lewis famously said … “Comparison is the thief of joy” … and yet over and over we allow ourselves to get robbed of our joy and peace. Because we want what another has or we want to be like someone we aren’t or have what they have … we miss resting in the contentment that Christ alone provides. I love Philippians 4:11 where Paul (who was sitting in jail at the time!) said … “I have learned to be content whatever the circumstances. I know what it is to be in need, and I know what it is to have plenty. I have learned the secret of being content in any and every situation, whether well fed or hungry, whether living in plenty or in want”. And then … drumroll please, he states the secret of being content in verse 13 when he says… “I can do all things through Christ who gives me strength”. That’s is, that’s the secret. Christ . He alone can give us strength to be content in our circumstances. And when we are content we don’t have to compare. God created us, He knows our situations and our circumstances and He wants us to keep our eyes on Him, not others. So back to my morning … I began to laugh as I continued to watch the moms file into the building with their babies. This sweet group of moms asked me to come share … not about how to get everything done, how to get their children to obey or the best and newest ideas in parenting … no, they asked me to come and share my real life mishaps and mess-ups. The longer I thought about it, the funnier it became. It is hilarious really that God can use even our imperfections for His glory. The things I used to compare myself about all those years ago now He is using to encourage others. Things are never going to be perfect. We are never going to be perfect. But we know the perfect one and He knows everything about us and our situations. 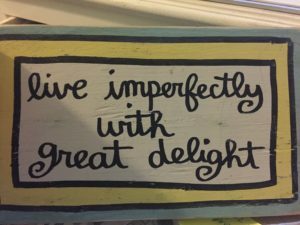 I have a sign on my desk that says “Live imperfectly with great delight”. I love that thought. Despite the fact that things may not be as we wish… we can live with delight.